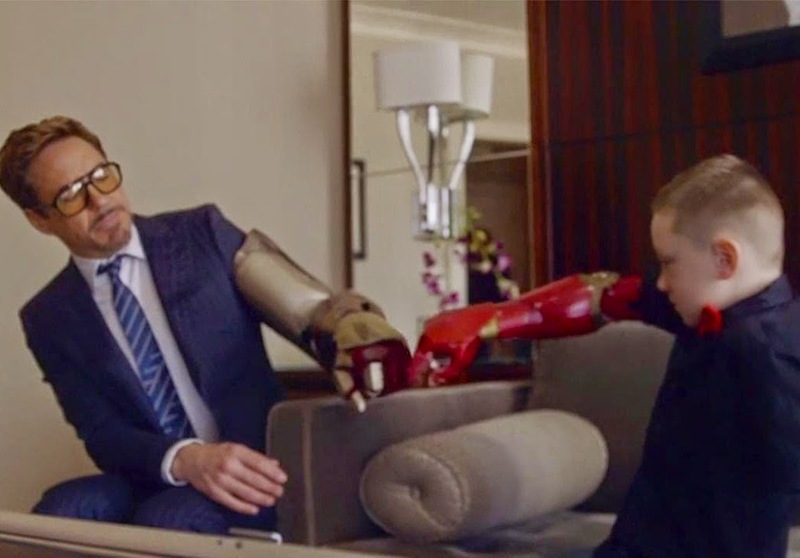 Delivering a brand new 3D-printed bionic Iron Man arm to a 7-year-old boy who was born with a partially developed right arm while promoting the good cause that is Albert Manero's Limbitless Solutions? Now that's a Superior Iron Man. Lo and behold, your feel-good video of the day (if not week). In a truly superheroic act, Robert Downey Jr. collaborated with Albert Manero, a superhero in his very own right, and his volunteer group, Limbitless Solutions. A Fulbright scholar and doctoral student in mechanical engineering at the University of Central Florida, Manero founded Limbitless Solutions in an inspiring ongoing effort to building and donating low-cost 3D-printed bionic limbs for children. Everybody would have seen a bionic arm by now, but I can bet with anyone that you usually only get to see it on TV news where some experimental bionic arms are tested by handicapped war veterans. A good reason behind this would be the incredibly high cost of a bionic limbs, a challenge that has been conquered by Manero, using the 3D printing technology. A usual bionic arm that can cost $40,000 is now for the low cost of $300. In this time and age of redundant invention and the lack of truly innovative properties being developed, it is indeed inspiring to see how technology can aid those who are in need. After learning about the volunteer group and Alex, a 7-year-old boy who adores superheroes and born with a partially developed right arm, Downey Jr. jumped into action to present Alex with his new arm, complete with some heartwarming Iron Fist bump moments between the two. With no further ado, check out the clip that can reignite hope in the coldest human hearts.